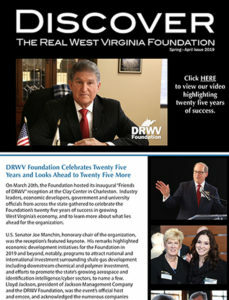 In 1993, Senator Jay Rockefeller, and a small group of the state’s business leaders, created the Discover the Real West Virginia Foundation, a private non-profit 501(c )(3) organization. The organization was created to diversify West Virginia’s economy and give existing industries the tools they need to be competitive in the global market. 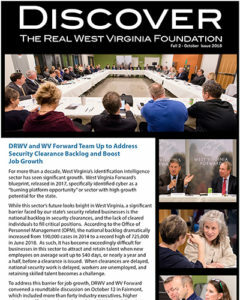 For more than two decades, the Foundation has crafted a focused economic development agenda and works with local, state and regional partners to bring new resources, ideas and opportunities to West Virginia’s economic development efforts. In March of 2014, upon announcing his retirement from the U.S. Senate, Senator Rockefeller asked U.S. Senator Joe Manchin to join the organization as its Honorary Chair, with Rockefeller taking on the role as Founder. Senator Manchin now leads the organization, and brings years of economic development and business expertise to the organization’s efforts. As a private foundation, with a board of directors comprised of the state’s leading business executives, the Foundation is able to develop and put in action a flexible agenda—one that is responsive to the changing needs of the state’s economy and the demands of its business community. The organization often acts as a catalyst, bringing together various stakeholders and organizations to help facilitate action toward a common goal.